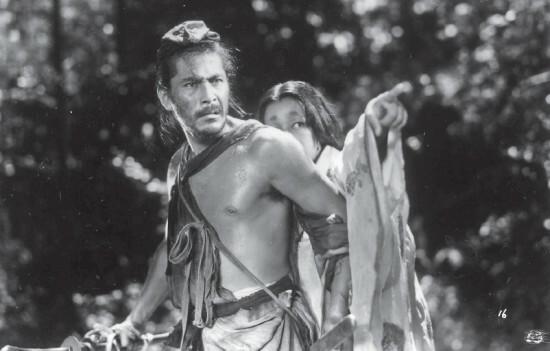 Toshiro Mifune starred in 16 films directed by Akira Kurosawa, including “Rashomon” (above) with Machiko Kyo. The winner of a Golden Lion at the Venice Film Festival in 1951 and an honorary Academy Award in 1952, “Rashomon” has been called one of the greatest films ever made. The latest Hollywood Walk of Fame “class” was announced Monday, with the late actor Toshiro Mifune (1920-1997) among those slated to receive stars on the famed boulevard in 2016. Appearing in almost 170 feature films, Mifune is known for his collaborations with the late director Akira Kurosawa on 16 movies, from “Drunken Angel” in 1948 (one of Mifune’s earliest films) to “Red Beard” in 1965. The list also includes the classics “Rashomon” (1950), “Seven Samurai” (1954), “Throne of Blood” (1957), “The Hidden Fortress” (1958), “Yojimbo” (1961), “Sanjuro” (1962), and “High and Low” (1963). Mifune’s work with other noted directors includes Kenji Mizoguchi’s “The Life of Oharu” (1952); Hiroshi Inagaki’s “Miyamoto Musashi” (1954), “Muhomatsu, the Rikisha Man” (1958) and “Chushingura” (1962); Kihachi Okamoto’s “Samurai Assassin” (1965), “Japan’s Longest Day” (1967) and “Zatoichi Meets Yojimbo” (1970); Masaki Kobayashi’s “Samurai Rebellion” (1967); Tadashi Sawashima’s “Shinsengumi” (1969); Kon Ichikawa’s “Princess from the Moon” (1987); and Kei Kumai’s “Death of a Tea Master” (1989). Although best remembered for playing stern samurai, Mifune also showed his lighter side in such films as Steven Spielberg’s “1941” (1979), Yoji Yamada’s “Tora-san Goes North” (1987), and Kayo Hatta’s “Picture Bride” (1994). Like Ken Watanabe today, Mifune was sought out by American and other foreign filmmakers when they needed a Japanese actor. His credits include “Animas Trujano/El Hombre Importante” (1962), “Grand Prix” (1966), “Hell in the Pacific” (1968), “Red Sun” (1971), “Paper Tiger” (1975), “Midway” (1976), “Winter Kills” (1979), the TV miniseries “Shogun” (1980), “Inchon” (1981), “The Bushido Blade” (1982), and “Shadow of the Wolf” (1992). Mifune was a hero in the Japanese American community and was a special guest at such events as Nisei Week in Los Angeles and the Cherry Blossom Festival in San Francisco. As noted in actor/writer Lane Nishikawa’s one-man show “Mifune and Me,” he was also a role model to many Asian American men growing up in the 1960s and ’70s, when there were few positive depictions of Asian men in American entertainment. Previous Walk of Fame honorees include Japan-born actors Sessue Hayakawa (1886-1973), a matinee idol during the silent era and an Oscar nominee for “The Bridge on the River Kwai,” and Mako (1933-2006), an Oscar nominee for “The Sand Pebbles” and a Tony nominee for “Pacific Overtures”; and a fictional character, Godzilla. Movies — Steve Carell, Bradley Cooper, Ashley Judd, Michael Keaton, Kurt Russell and Quentin Tarantino. Television — Barbara Bain, Kathy Bates, Roma Downey, David Duchovny, Allison Janney, Rob Lowe, Debra Messing, Tracy Morgan, Gary Sinise and the late broadcast executive William S. Paley. Recording — Shirley Caesar, Cyndi Lauper, Adam Levine, LL Cool J, Bruno Mars, Joseph B. “Joe” Smith, Itzhak Perlman and “Mama’” Cass Elliot of The Mamas & the Papas, who will be honored more than 40 years after her death. Radio — Ralph Lawler, the voice of the Los Angeles Clippers. Live theater/live performance — Angelica Maria, Harvey Fierstein and Kevin Hart. The honorees were chosen from among hundreds of nominations to the Walk of Fame Selection Committee of the Hollywood Chamber of Commerce, according to spokeswoman Ana Martinez. The committee’s selections were then ratified by the chamber’s Board of Directors. Recipients have two years from the date of selection to schedule their star ceremony.